While there are plenty of applications, and plenty of additions to Vim and Emacs, that help you write a novel, not many can help you write a screenplay for theater, video, television, or films. This may be due to screenplays being more specific, more niche, and perhaps a little lower down on the spectrum of dream careers for people who can follow one word with another. But they're also (theoretically) easier to write than a novel and offer another potential avenue for people wanting to find a path into professional writing. With the odds stacked against authors getting their work published, additional avenues are always worth pursuing. KIT Scenarist is a Russian application written for screenwriters. It gets off to a great start by offering to run with a preference chosen from 12 different languages, and either a light or dark theme. You then get to choose which modules to enable by default, such as the research module for collecting your background information, the cards module to help you build a script from a series of ideas written on cards, the statistics module to help you charge per brilliant word, the script module itself with support for scenes and standard scriptwriter tools, and, finally, a starter template, such as the "Final Draft Screenplay" template. However, you can just as easily create your own templates or apply a template to an already worked-on script to change its layout and structure. The application feels more like an IDE for scriptwriters than an augmented text editor. When you start a project, for example, you're guided through creating characters and adding background details for them, creating scenes, adding dialogue, and pulling the whole thing together into a script that can easily be exported as FDX, PDF, Fountain, and DOCX formats. For writers, simple things such as dynamic word count are seldom implemented, but Scenarist gets this right, as it does the automatic text formatting, which gets out of the way and lets you write your dialogue or your descriptions without having to worry about syntax. You can easily see the plot status, organize the threads of your story, and change things around without having to resort to a pair of scissors and randomly sequenced bits of paper. There's even a review mode where editors can leave comments, and your research can include external directories and images, all selectable from a module tab that can be opened alongside the editor if you opt for the two-panel mode. Scripts have a very specific layout and format, and KIT Scenarist can generate this output from your content without you needing to know the specifics of how to generate the exact formatting. This also includes essential details such as the timing for each line of dialogue, reflected in the chart for the statistics overview for the entire script. Scenarist is remarkably mature and capable. 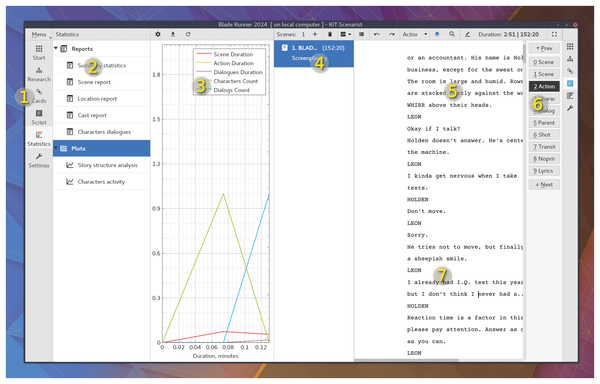 The Qt user interface makes it feel like a native Linux application, and it's easy to see why there are more than 1,000 script writers using the application already. 1. Edit modes: Scenarist covers each step of the script-writing process, from research to printing. 2. Reports: Characters, scenes, and locations can all be described separately. 3. Graphs: See how you hit timing targets for production planning. 4. Screenplay: Scenarist is also a serious editing tool, splitting your script into scenes and sections. 5. Editor: Add timing information, and import character and scene details from your overviews. 6. Toolbar: All the elements that make up a screenplay can be dragged into and written easily. 7. Review mode: Generate a PDF script or collaborate with other editors.